Sound (9.2/10) – From the first listen it was clear that the Custom Art Music One, which utilizes a vented balanced armature driver, is one of the best earphones in its class. It pursues a very coherent, natural sound that impresses with its weight and smoothness. The low end extends well and offers up good impact. It is tighter than the boomier, more mid-bassy 1964EARS 1964-V3 but, as with the other silicone customs I’ve reviewed thus far, there is a certain difficult-to-describe characteristic to the bass that makes the earphones seem more impactful while taking away slightly from the detail and texture, which I attribute to the silicone. This allows the Music One to maintain good bass control while providing ample presence – more than with the dynamic-driver HiFiMan RE-400 and the Ultimate Ears 600, for example – but also means it can’t quite keep up with the low-end resolution of, for example, the pricier EarSonics SM64. The mids of the Music One are smooth and clear, with good note thickness and again a very natural presentation. The midrange is definitely one of the strengths of the earphone but doesn’t present as overly forward, likely due to the impactful bass. The HiFiMan RE-400 and Ultimate Ears 600 both seem a touch more mid-centric than the Music One, for example. 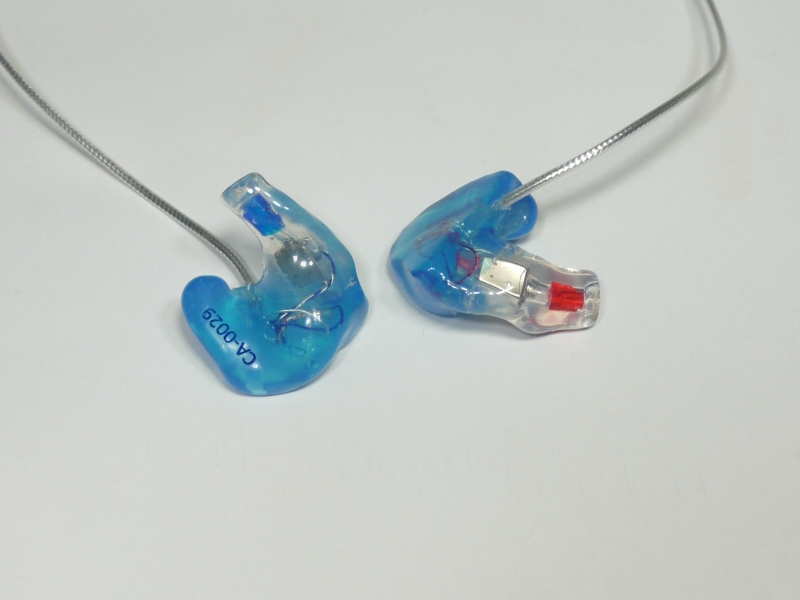 Clarity is excellent as well, falling just a hair behind higher-priced sets such as the EarSonics SM64 and 1964EARS V3. The treble of the Custom Art is a little less prominent but still remains in good balance with the overall sound, reminding me of the way recent HiFiMan releases have been tuned. It is not the most crisp-sounding, but tends to be natural and smooth. The same is true of the presentation – the Music One has a spacious sound, especially compared to the majority of other single-BA earphones. It also impresses with good soundstage depth and the ability to portray intimacy properly when necessary, further making it a great all-rounder. The A161P is a single-armature earphone based on a Knowles ED transducer and tuned for a crisp and punchy sound. The A161P and Custom Art Music One are not exceedingly different in terms of balance, and on some tracks sound rather similar overall. With in-depth listening, however, it becomes clear that the Music One is a significantly more refined earphone. While the A161P has good bass punch for a single-armature set, the Music One is more impactful and has a thicker, weightier note presentation. Its tone is warmer overall and it makes the A161P sound thin in comparison. The A161P tends to be brighter and, next to the rather smooth Music One, sounds somewhat harsh and grainy. The A161P is also more forward while the Music One offers a wider presentation with better depth and imaging. One of the many reasons the dynamic-driver VSonic GR07 has maintained its popularity over the past few years is that it can go toe to toe with many higher-priced sets. Pitted against the Custom Art Music One, it loses out in midrange and treble quality but partly makes up for it with great bass. The main differences lie in the midrange, where the Music One offers better presence and clarity. The GR07, in comparison, sounds slightly mid-recessed. This, in turn, accentuates the bass of the VSonics, which appears a little more impactful but also quicker compared to the Music One. The Custom Art unit offers smoother treble while the more energetic GR07 is susceptible to sibilance. The presentation of the GR07 tends to have good width and little else, while the Music One is more well-rounded and offers depth and imaging to match. Long-time industry leader and innovator Etymotic Research first released the ER4 in 1991, and its ER4S tuning remains one of my all-time favorite universal-fit earphones. The Custom Art Music One and ER4S each have advantages over the other and it’s difficult to pick a clear winner here. The Music One definitely sounds fuller and warmer overall, thanks in part to its weightier low end. Despite the bass, however, it appears a bit more mid-centric overall. Its treble is less prominent and more forgiving, and its midrange – thicker and more attention-grabbing. The leaner ER4S can at times sound a touch clearer and has a small advantage in overall balance, while the Music One oftentimes sounds more natural thanks to its thicker, fuller sound. The ClearTuneMonitors CT-200 is a dual-driver acrylic custom priced higher than the Custom Art Music One. It is a neutral-sounding earphone that rolls off gently at either end of the frequency spectrum. Compared to the CT-200, the Music One has an advantage in bass depth and impact. Its low end is more extended and powerful, and grants the earphone a warmer overall tone. The CT-200 is brighter overall, presenting more forward upper mids in comparison. It also sounds a touch clearer and its treble is more crisp, appearing a little more detailed as a result. In terms of presentation, the CT-200 is more spacious and open-sounding while the Music One tends to be slightly more intimate. Nonetheless, the Music One again sounds very natural in this comparison – arguably more so than the CT-200 thanks to its warmer, thicker sound. The triple-driver, acrylic-shelled Alclair Reference is an accurate-sounding earphone that offers good presence across the entire frequency spectrum. It has similar bass depth and impact to the Custom Art Music One but tends to be a little tighter and more detailed. As with the VSonic GR07, its midrange is more recessed compared to the Music One, which has rather prominent mids. The Reference is still clearer, however, and seems more resolving as well. In general, the Alclair monitor sounds better up to the upper midrange, where it starts to display some stridency. Its treble is more prominent overall and tends to be peakier and more sibilant. The Music One, on the other hand, is smooth and far more forgiving, and sounds more natural overall in the treble region. Finally, the Reference is overall more spacious and images a little better than the Music One. Value (10/10) – The Custom Art Music One is an excellent value, combining the noise isolation of custom-fit silicone shells with a single balanced armature driver delivering an organic, coherent sound. The ultra-light low-profile silicone shells of the Music One put its fit and comfort above not only universal monitors, but other customs as well. Lastly, in addition to great attention to detail spanning everything from the cable to the accessory pack, the Music One offers more customization options compared to other silicone CIEMs, making it an even tougher earphone to fault on any front. Thanks for the great reviews on this site! Very valuable. I have used Etymotic Research ER6i’s for the past couple of years and am now looking for a step up in quality, comfort and *defintely* isolation. I liked the amount of bass on the ER6i’s (a bit beefed up from the standard ER6) but will say that i found the isolation so-so for my ears. I also own a BeyerDynamic DT770 Pro which i really like. My budget is <€300, so i'm wondering if maybe the M1's would be up my alley? Or maybe you have another tip for me? Appreciate the time, thanks alot! – these will be my first CIEMS. I want to listen to music mostly during long commutes and airtravel, without any background noise. – I will mostly be playing 256kbps AAC files from my iPhone 6s without any extra amplification (blasphemy, i know, i know…). – I listen to everything from pop to rock and metal-/posthardcore, to folk, jazz and classical music. – My experience with sound has been playing in bands for years, recording in studio’s and assisting with the mixing and mastering process afterwards. I have the BeyerDynamic’s for at home, and want these CIEMS for simply enjoying music on the road. Would the Music One be a good choice? Or should i defintely bump up? Any tips? The Music One is not the most logical step forward if you’re into Etymotic sound. It’s warmer, more mid-centric, not as clear, and lighter on treble, all of which can be cons if you like the way the ER6i is tuned. Personally, I’d consider one of the ER4 models and maybe custom tips for it, it’s (obviously) a lot more Etymotic-like in sound, and the isolation is as good as any custom I have. I’ve just lost my PFE 122’s, so now I am on the lookout on what to get. I use my IEMs when out and around and my Denon AH-D2000 when I am sitting at home. I liked the sound of my PFE 122’s but always felt that they lacked extension in the low end! Not necessarily more bass, but just more extension. Like I have in my AH-D2000’s, their fault is their mids which are more recessed. I like the sound to be quite neutral, and I am a sucker for treble clarity, really don’t like muffled or too laid back sound. Love hearing details in the music – so that is a must. I have used foam tips for my PFE 122’s as I usually get a headache from silicone due to the way they seal. And I uses the grey filters. Now, what should I get? I have roughly 250eur/USD to spend. Impressions I can get made free of charge, so that is not a problem for CIEMs. I have looked at the custom arts here, but I don’t know if that is the correct way for me. And forgot to say, that I loves the microphone and button combo of the PFE’s so that would be a big plus for me if possible in any way to get. Bass extension is not one of this earphone’s strengths, so if that’s you primary complaint with the PFE 122 I’d probably skip the Music One and go for something with a bit more proficiency at the low end, even if that means a touch less accuracy overall. A few earphones that have a pretty neutral sound with good bass punch and depth are, for instance, the VSonic GR07 Classic (or Bass Edition), DUNU Titan 1, and Philips Fidelio S2. All three should sound more natural at the low end than the PFEs, all three have pretty well-balanced sound (albeit in different ways – see their individual reviews), and all three have a pretty shallow fit in the ear, which may help with your fit issues. The S2 is the only one that comes with a mic/remote, though, so that’s pretty limiting. I’ve just found that unless in a very quiet environment it can be hard to hear the low end from the PFE 122’s. What I’d also like to have better than the PFE’s would be clarity, neutrality, detail and soundstage. I think my main problem with using silicone is not from the depth but rather the fact that single flanged siliconetips can move a bit back and forwars thus changing pressure – and that I can for some reason not tolerate. I use custom in ear hearing protection when hunting – both silicone shell and hard shell – these I can use for an entire day without problems. So I think that I would like to go for CIEM’s or at least an IEM with foam tips. I would perhaps be able to stetch my budget to a CustomArt Music Two instead. Or another CIEM/IEM in the 350USD range. Does this open up to better alternatives or how much should I spent instead? I would like to step up in quality from my PFE’s not stay the same. I still haven’t tried the Music Twos so I really couldn’t tell you. None of the custom IEMs I have in that price range have very good bass extension (which is not to say that there aren’t any out there). The PFE is a top-tier IEMs when it comes to clarity, detail, etc – it’s easier to find something with better bass than to get an upgrade in those areas. And it’s nearly impossible to do both at the same time. Anyway, if upping the bass (especially the deep bass) to a more natural amount is a priority, I’ll stand by my recommendation to get something universal with a dynamic driver (and foam tips if you must). I must admit that the DIY’er in me took over, and when I saw that I ie could build a Music Two for roughly half the asking price I just couldn’t resist – so I went out and bought materials for building a Music Two clone. And I am trying to figure out which BA driver my so beloved PFE 122’s used (do you know?) and if I can find it I will build a beafed up 122 – so most likely going to add a “subwoofer” to it and call it a day. Ah ok, thank you for your time! Yea, I really loved my PFE’s except for their bass extension. So guessing here, if I really wanted an upgrade I’d have to spend like $1000 on a top tier (C)IEM? Well, in the meantime I couldn’t resist my inner DIY’er, so I decided to build a Music Two clone (easy build). Seeing as I could do that for about half the asking price of the Music Two’s I just couldn’t justify to go out and spend big bucks on a premade one. Sadly my UE900 broke, now I want to go custom but I’m on a budget. Will the Music One be a significant downgrade? Coming from the UE900 I’d ideally want something with a bit more end-to-end extension. Problem is, most of the customs I’ve tried that deliver that and still sound balanced are a lot more expensive, so if you’re on a budget the Music One is likely the be the best I can recommend regardless. I am trying to understand the sound signature of the Custom One as it seems to be mid-centric based by your review. Would the sound signature be similar to the Westone Um2/Pro 20 minus the boomy bass and rolled-off highs? Thank you for your input. Unfortunately I don’t have much experience with the Westone UM-series IEMs below the UM PRO 30 so I can’t provide a direct comparison, but the Music One definitely does not have boomy bass and treble reach is respectable for this price range, though not the best. The overall sound of these is just slightly on the mid-centric side of neutral. I think right now, my favorite sound signature would be the BA 200. I read below that the BA 200 has better lower extension than the custom ones but how are the highs In comparison? Clarity? Thanks. I am definitely considering getting the custom ones. Your help is always appreciated. In both aspects they’re quite close to each other. Clarity is a little better with the BA200 but the highs are slightly smoother on the Music One. A little more laid-back, too, but it’s probably a worthwhile tradeoff for the smoothness (unless you generally prefer brighter treble, which neither really provides). and believe me I’m not joking ,I heard most of the ciem but Flare r2 pro is a dif. than any of them , don’t let the price fool you . To prepare the question, i use a Shure SRH1840 with a MacbookPro (listening to flac 16&24bit music), and i used to also use iBasso dx90 + Westone W10 for my street music (unfortunately i got robbed). I appreciated the westone, though i recognized the sound wasn’t as clear as my shure’s. I adore my Shure Headphones since the sound is purely clear, and very detailed, making the whole sound real (as in a real concert hall). Custom Art Music One, Dunu Dn-2000j, Fidue A83 & Westone W20. To precise, i listen to various kind of music: mainly Jazz & Classical, but also often Rock music & Electro music, so i would appreciate some polyvalent IEMs. Could you help me making my choice? In my current state of mind, it should be between the Music One and the Dn-2000J. All of those can be considered an upgrade from the W10s, but heading in two different directions. The Custom Art and W20 give you an even more neutral, accurate, “reference” sound that seems to be more of what you want (focus on clarity and detail). Between these two I would pick the Custom Art, but as with all customs I suggest you only buy it if you’re certain that this type of sound is what you want – can’t exactly return or re-sell a custom monitor with any sort of ease. The DN-2000 (I still think it’s better than the DN-2000J), Fidue A83, and other IEMs of that type give you a more colored (less neutral), more exciting sound with some bass emphasis and brighter treble. It’s more of a change from the W10 but only you know if you might prefer it to the more neutral/accurate option of the Music One / W20. I’ll head for the Custom Art ! If your web view count rose the past couple weeks, then I’ll take the blame. Just discovered your site and I have been devouring the content; many of the pages over and over. Thank you. Your hard work is noted and greatly appreciated. These will be my first headphone purchase (ignoring low-cost buds and headphones) and I need help. I have read your guides but I am still having problems defining my music enjoyment “sound signature”. I enjoy listening to symphonic classical music, smooth jazz, and music from the 60s and 70s; including Bossa Nova, acoustic guitar (ex. Ottmar Liebert), and trumpet (ex. Herb Alpert). From these genres, can you help me understand in the audiophile language what may be my preferred sound signature and what I should look for in earphones? I know, I am pushing the envelope with this question. Please excuse my ignorance. From your reviews, I think that I may enjoy these Custom Art earphones. I am also considering the Etymotic Research ER4P-T, the Alclair Reference, and though somewhat over my budget of $300, the 1964EARS 1964v3. What are your thoughts? Glad you’ve been enjoying the website! As far as I’m concerned there’s no 100% correct or accepted sound tuning for any particular genre – there might be some that the majority of listeners prefer, but there’s always a good chance another person may disagree. Since your music tastes are fairly varied, why not start with something relatively balanced? It seems like you’re already going in that direction with most of the sets you’re looking at closely (the V3 being the exception). I typically don’t recommend jumping off the deep end by getting a custom for your first high-end in-ear anyway. Of course you could do it and it could turn out great and take your listening experience to another level. But if you end up wishing it did this or that differently, you won’t have any recourse. The ER4PT would therefore be my pick. I think it’s an earphone that everyone needs to try at least once, and it gives you an extremely potent example of one particular sound tuning. You can also consider starting with the Ety HF5 or HF2 instead. You get most of the performance of the ER4 at a much lower cost. I usually recommend people take their time and try a few mid-tier IEMs and figure out their preferred sound before committing to a top-tier or a custom-fit product. This approach is less efficient in terms of time/money and takes some patience, but tends to have good results, and in this particular case with the HF5 and ER4 being so close in performance, it makes even more sense. Not to mention that for a higher-end earphone the HF5 is relatively consistent between different sources and sounds good out of modern smartphones. Not being an ultra high-end and sensitive multi-BA earphone (like the 1964-V3, for instance) you can get away with just using your phone. Wow! What a quick, detailed, and spot-on response. THANKS. I will drop the V3 from my list. Currently, the M1 is $55 cheaper than the ER4PT ($234 v $289) that is why I was not hesitant on a custom. But I would need to add the cost of the audiologist fitting. Would the M1 need the amp for when I am away from my home AV center? You brought up a good point about starting with a cheaper set. Right now on Amazon, the H2 is $129 (black) and the H5 $120 (cobalt). So basically, the same price. Between the two, which do you recommend as I am not sure which is supposed to be the better? For “only” about $110 more (plus $$ for fitting) there is the M1. At these prices, do you still lean towards the H2/5? Addendum to my followup post: if that makes a difference, for a short time the HF2 is $80.49. You also have to keep in mind that a good condition ER4 will lose maybe 30% of its value if you decide to resell it (less if you got it at a discount to begin with). A custom monitor will lose a lot more. And no, the M1 doesn’t need an amp – it’s a single-BA, and neither overly sensitive nor very hard to drive. It is better than the HF2/HF5 (those are identical, btw, but the HF2 also has a mic you can use with your phone), especially in terms of note body/fullness but again considering your experience is with inexpensive IEMs it’s hard to say if the difference will be noticeable. If you were already using a decent mid-high tier IEM with this type of sound signature (like a HiFiMan RE-400 or something), the M1 would make more sense as an upgrade than the HF2, but as is it’s a tough call. One thing is certain, the HF2 at $80 is a killer value. I don’t think there’s a better deal to be had on a reference-grade in-ear. I never resell so that won’t be a consideration. And, alas, the $80 deal only lasted a few hours and is now gone. I will watch for deals over the next week and get the HF2/HF5. Thank you for the recommendation. As I learn more about my sound taste over the next year, the Custom Art could come back on my short list. They could help, but not enough to spend another $200-300 unless you’ll also get good use out of your amp otherwise (using it with your headphones and not just IEMs, using it as a DAC to bypass potentially noisy hardware, and so on). I always recommend going with a DAC/Amp over a DAC when possible because you don’t want to be double-amping (i.e. connecting an Amp the the headphone output on your phone or computer). The OPPO HA-2 is a favorite, and I believe it’s right in that price range. Very full-featured device. You mean it isn’t a good idea to spend $300 for a DAC/amp to accompany a $120 IEM? 🙂 I meant a Digital Audio Player (DAP) so I could have more stored music choices went I am out. Plus, hopefully, a better DAC/amp than my phone. I use an Android phone and the OPPO instead of a DAP (prefer the interface of my phone to any “audiophile” DAP I’ve tried) so I can’t recommend a standalone unit. I do miss having something just for music, though. The Fiio DAPs look tempting but I can’t recommend them since I don’t use them myself. Hey |joker|. First of all, thanks for your reviews. I am planning to buy my first customs. I will mostly be listening to metal (death, black, djent), but I also like prog rock (King Crimson, Wilson,…). Due to a better bass Music Two were my first choice. However, I am wondering if there is anything better in similar price range(350-400$) or slightly above it (additional 100-150$) either from CA or some other manufacturer. Unfortunately I haven’t tried the Music Twos, but the more enhanced-bass (compared to the Music One) CIEMs I have all fall above the $400 mark, so I don’t have any alternatives to recommend. I was wondering about potential sources for the Music One. I listen to most of my music through a macbook pro or Fiio X1, so would either one be adequate to drive and match fairly well with the Music One? I’m not looking for perfection. However, if a portable amp would be better, what one(s) would match up the best for $120 or less? One last thing, my only headphone is the original Sennheiser Momentum (darker with some treble roll off), I like the sound of those pretty well, but sometimes I find them congested or bass heavy. Would the Music Ones be a very drastic change? You should be fine, the Music One is not too picky so your sources will be adequate. If you’d said “cheap Android phone and Lenovo laptop” I’d say you should get a DAC, but your hardware is quality. Music Ones won’t be congested or bass-heavy, that’s for sure. They’re quite resolving, but short of “analytical”. Sounds like they should be a good compromise for you. Thank you for your reply. It sounds like I will get them when I have some available funds. Thanks for the help, Joker. So, my dog ate my Westone 4’s… RIP. I think I want to use this tragic event as an excuse to jump to a custom. I’m not in the position to drop 5 benjies on 1964s like i want but i do want something comparable and/or better to the sound of the W4’s. What I’m trying to say is that I don’t want to downgrade on the sound – this pair only having one driver concerns me. What would be your thoughts on this pair vs the W4s in quality of sound? The overall sound quality is close but the tuning of the Custom One is very different from the W4. The Custom One is more of a reference monitor – very flat and smooth, no bass enhancement, not much coloration to the sound. The W4 has a moderate bass boost, warmer and darker tone, a slight dip in the upper midrange, and so on. As such, you can’t call either an upgrade to the other. Just two earphones with different sound signatures and purposes. Thanks for your reply!! So I’m thinking that I’ll pass on the Custom One’s then, I really loved the sound signature of the W4’s. Not that I’m unwilling to switch to a different sounding pair, I am, but I don’t want to switch to one that doesn’t have any coloration at all. I’m thinking the 1964-V3’s are in my future. The distant future, but still, the future. I read all of the ‘select comparisons’ on the V3’s review page, but my only other experience is with the W4’s, which are not listed. Would you mind doing a comparison of the V3’s and the W4’s? V3s are also quite different but at least they have an off-neutral sound with enhanced bass, like the W4s. The upper mids are more prominent on the 1964s and the treble is brighter and more sparkly. It’s a more lively and exciting sound, kind of like applying a “loudness” or Rock equalizer setting. Not a bad thing in my book, and basics like clarity and detailing are still well ahead of where the W4 is at. Great review as always. Has me considering switching my upgrade to these Custom Ones instead of something like the Sennheiser Momentum 2s or Sony MDR-1As. That said, I’ve never placed an order for anything out of Europe before. 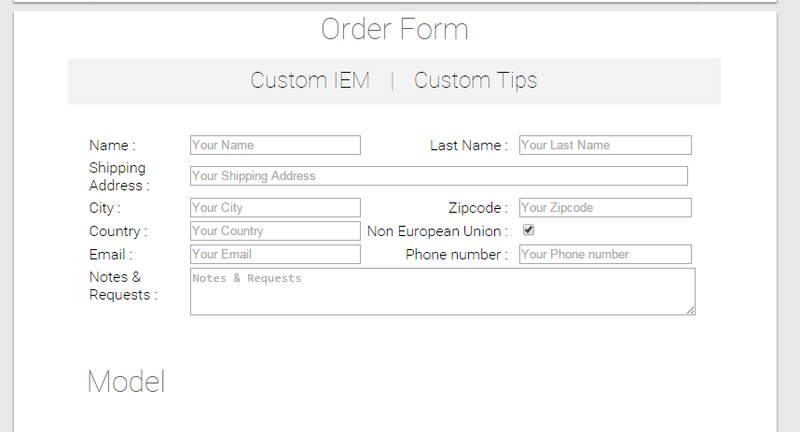 Have you had much feedback on how well the order process works, as well as how long it takes to receive an order? I haven’t heard anything bad, which is usually a good sign :). The order process seems very straightforward and Custom Art has a good reputation on Head-Fi as far as I know. I’d also suggest straight up asking Custom Art for a delivery estimate before placing your order. I’m considering buying my first pair of custom iem. Currently I own a pair of rha ma750i and I love it. I’m decided between the Music One and the 1964EARS V3. Since it is my first pair of customs, I don’t know whether I should go for the V3 right away or the Music One since it is a lot more expensive. How does the sound of the two compare to the ma750’s? The V3 is definitely more of an MA750 upgrade. The Music One is a very different sort of sound – more focused on the midrange with significantly less bass and more relaxed upper mids. It’s a great earphone, but it has little in common with the MA750. Thanks, I’m thinking about buying the V3 but I have no experience with ciems. Are there things I should consider before purchasing? Like how would the fit/comfort/isolation/portability be different compared to regular iems? They do cost quite a bit so I’m not willing to take a gamble haha. Not as different as you may think coming from an MA750, which has pretty decent isolation and an over-ear fit. Better, of course, but it won’t completely change how you use your IEMs. I have one more question. I have read that the V3 has more treble energy than the ma750. I listen to a lot of EDM, predominantly deep house and electro house. I’m sensitive to bright treble and I would get listening fatigue after periods of extended listening. The ma750’s feels right with the foam tips. How much brighter would the V3’s be compared to ma750? Are there other ciem/iem you would recommend me at this price range? Thanks alot for your help really appreciate it! Not much brighter – while I would agree that the V3 has more treble energy on the whole, the MA750 may actually have more upper midrange boost than the V3, which many people are more sensitive too than higher frequencies. The Music One has smoother treble compared to both the V3 and the MA750. If the MA750 feels about right, the Music One might be a little low on excitement in comparison. I’ve only tried smoother CIEMs in a slightly higher price range – for instance the Gorilla Ears GX-4b: https://theheadphonelist.com/headphone_review/gorilla-ears-gx-4b/ . Nearer to Music One’s price bracket you run into the same issues – either the sound is more neutral than the MA750, in which case you might as well go with the Music One, or the top end is more prominent, in which case you might as well go with the 1964-V3. This is a great review, as always. You’re my go-to on all matters IEM. Do you have any plans to get your hands on the ei.8s? I feel like a comparison between the two would be really interesting, considering how new the ei.8s are and how similar their price points are. I myself am undecided between the two. My bad, I meant ei.3s. I would be curious to try the ei.3 but I don’t have a pair yet. I still haven’t published full reviews of my Pro330v2 and Harmony 8 Pro so if I do check it out it definitely won’t be very soon. I was asking myself what’s the main differance between those Music One and the Shure 535. I’ll have the possibility to reshell the last and am looking to see how wthe M1 compares to the 535? I’d be asking myself the same question. They’re really not that different – similar strengths, similar weaknesses. Unfortunately I don’t have the SE535 anymore to A:B them for you. My gut feel is that the SE535 will have a bit better bass quality/resolution and the same will be reversed in the treble. Hey |joker|, I’m currently considering getting the Music Ones as a placeholder whilst I wait for my end-of-year bonus, which I intend to spend on the UERMs. I have auditioned the demo version of the UERM quite a number of times already, and each time it left me just wanting it even more. So, does the Music One’s sound signature bear any resemblance to that of the UERMs, or should I just hold off until I get the one I really want? Hmm.. the Music One is a great starter custom but since you’ve tried the UERM and are looking for that sort of sound, I’d probably peg it as being a little too smooth and relaxed. The UERM definitely has a brighter, more energetic sound – more like an Ortofon e-Q5 or VSonic VC1000 or something. The Music One would make a decent compliment to the UERM, providing a rather different approach to a “balanced” sound signature, but it’s not that great a placeholder for the UEs. Hey, thanks for the reply |joker|. Another question I do have about the Music One is that should I automatically assume it has a fast decay and good instrument separation due to it being a vented balanced armature design, or should I expect otherwise? Coming from an Audio Technica IM50, I am a bit weary of its mushy presentation of complex passages. There’s other factors that differentiate one balanced armature from another in these respects, such as overall response curve and note thickness. The Music One is about mid-pack for a BA – it won’t give you the speed and separation of a more “analytical” set like the Etymotic ER4S or VSonic VC1000, but it will have faster decay and better separation than many of the warmer, fuller-sounding BA sets (e.g. EarSonics SM2). Hi! First of all, thanks for your amazing reviews. It’s close to impossible to find any other source of neutral non-populistic reviews. I’m thinking about going custom after my VC1000 broke in half twice in the course of a month. I totally loved them, especially the clean upper-mid/lower-treble. I love 10kHz+ sparkle and 1kHz(ish) midness, on the other hand I deeply resent harshness (á Meelectronics M6/some Shure SE IEM’s). One of the reasons I love the Beyerdynamic DT770 Pro. – When it comes to treble, would you describe them as a VC1000 with a lowpass filter (just less 10kHz+)? Do you still kind of feel like you’re in a big space and not in a closet? Are the cymbals still crisp? I’m not too particular about the bass, just that it’s not boomy. I’ll be using them for casual listening (all genres the are basically) and stage monitoring. Apologies for the abstract questions, it’s just hard to know what to ask lol. Thanks!! This is a tough one, because while the Custom Art and VC1000 are both close to neutral, they are two different approaches to getting there. I’m leaning towards recommending that you stick with a brighter earphone than the Music One. The sparkle of the VC1000 is not really there with the Custom Art – they’re obviously a long way from dx.com earbuds, but to me they sounded more like an RE-400 than the VC1000 in the treble region. Likewise, crispness is one of the VC1000’s greatest strengths, and that’s hard for the thicker-sounding Music One to compete with. If you wanted a little more body and note weight than the VC1000 then sure, the Custom Art is the way to go. But with those specific requirements I’d probably find a different upgrade direction. Howdy ljokerl. A while back, I bought a pair of VC1000s based on your review of them, and while I absolutely adore the sound (indeed, they’re the only sub-$200 headphone of any size I still listen to), I’m feeling the need for a bit more comfort and isolation on my commute. I reckon a pair of CIEMs will oblige in both regards (particularly comfort, honestly, the 35ish dB of isolation on the VC1000s is fine), and given how well the US dollar trades with the zloty these days, I was thinking about a pair of Music Ones. How do they compare to the VC1000s, both in quality and sound signature? Would you still rate it as the most comfortable IEM you’ve got? Lastly, while I know you’re not fond of headphone to IEM comparisons, could I get any sort of impression of how they stack up the HE-560? I know it’s a bit of an odd request, but they’re my favourite headphone by far, and I know that you’ve got one as well. There’s a couple of reasons I don’t like headphone vs IEM comparisons, one of them being that headphones and IEMs that are similarly balanced-sounding on paper may not actually sound all that similar in the ear. In this case, as much as I like the Music One, I can say that it doesn’t quite stack up to the HE-560. The smooth tuning and the fact that it’s single BA might have something to do with it. Compared to the HE-560 it just sounds like it runs out of steam at the limits, top and bottom, and the clarity and bass tightness aren’t quite there (your VC1000 will be closer to the HE-560 in this respect thanks to its leaner, brighter sound). To get those things at HE-560 level with a more full-bodied earphone, you’d need something like a Custom Art Harmony 8 or other top-tier IEM. Well, I’m thrilled to hear it still compares on comfort, but I must admit that warm and smooth aren’t things which appeal to me as much in audio as exacting detail (I consider myself an anti-Tyll, in terms of audio preference) and precision. Are there any sub-$600 options which are closer to the VC1000 (or ER4, actually, as I’m also quite fond of that) in tuning and not too far behind the Music One in comfort? Ah, thank you for the comparison! I can definitely understand that it’s a bit apples-to-oranges (rather as with speakers to headphones). I suppose I shouldn’t have gotten my hopes up, there, but since I’ve got the HE-560, it’s become a bit of a reference point for me, and I was really impressed with how well my VC1000 kept up with it given the stark price difference. With a $600 budget I’d consider the Custom Art Pro 330v2 – I compared it to the Music One here: https://theheadphonelist.com/brief-impressions-custom-art-harmony-8-pro-pro-330-v2/ . It sounds like you’re located outside the EU, so the pricing will be quite favorable without the VAT. They’re not miles apart in performance, but the PRO330v2 goes that extra step in ensuring its smoothness doesn’t tank the clarity. The PRO330 is a little larger than the Music One and not as low profile in the ear, but comfort is comparable. For a brighter, more VSonic-like sound I would recommend the Alclair Reference, but it is acrylic and not silicone (plus, I prefer the smoother treble of the PRO330 and with no VAT the price difference between them won’t be huge). Wow, the Pro 330v2 looks pretty stellar, but also quite costly. I am located outside the EU (USA, specifically, so I have both no VAT and exchange rates in my favour), but unfortunately the Pro 330v2 seems to be about 2600 zloty shipped, which is roughly $700 USD. $600 was already pretty much the most I could justify paying, so unfortunately that puts me over too far, particularly if the performance is pretty close. The cheaper Alclair looks pretty darn nice, but based on your review of it, I think I’ll stick with silicon. Comfort and isolation are my paramount considerations in IEMs, so I’m willing to accept a sound that’s not quite the best I could get if it means doing better in those areas. I’ll probably end up going the way of the Music Ones and start a savings fund for an eventual Harmony 8 or something along those lines. Thank you very much for your advice! That’s odd, when I fill out the form (http://www.thecustomart.com/formiem.php) I get a price of 2012 PLN with the optional detachable cable, which is about $540. Without the detachable cable it’s closer to $475 shipped. I missed your last reply, my apologies! The Pro 330v2 is still consistently coming up at 2550 PLN for me, though. However, fortune has smiled upon me (to a rather ludicrous degree, frankly) and I have quite a bit more to throw at an IEM now – over $1000, if needed. Having read your and Joe’s reviews of the Harmony 8 Pro, it’s currently the top of my list, but I was curious if there were any other IEMs in that range I should consider, my requirements being the same (that is, comfort of upmost importance, particularly for long listening sessions, then isolation, with sound quality ideally matching my HE-560, if not necessarily having quite the same tuning). You should also take a look at the Hidition Viento-R which is a relatively neutral choice with more warmth than the NT-6. Also, the EarWerkz Legend-R is a different take on neutral, possibly similar to the 4S. I was impressed with the overall sound. At $1000 for neutral sound, the only other sets I would consider are the Noble 4S and 1964 V6-Stage. The Noble 4S is interesting because it has a different approach to neutral sound (think HiFiMan RE-400 vs a VC1000; both are pretty neutral, but they sound quite different). I have no doubt that some listeners will ultimately prefer the smoother, more midrange-focused Noble. However, with your stated anti-Tyll leanings, I would probably keep the Harmony 8 Pro as the #1 contender and the similar but slightly less refined V6-Stage at #2. Joe: I had looked at the Hidition NT-6, but I hadn’t heard much about the Viento-R. It definitely looks interesting, but I note that you scored it as a 4.5/10 in isolation, versus the 9 of the Harmony 8 Pro. Being as isolation is a fairly major focus for me here, would you still reckon it’s worth serious consideration? I don’t really need more than a deep-insertion universal fit level of isolation, but I admit that the score being below the median kind of worries me. Joker: Ah, I think I know what it is: http://i.imgur.com/wVK4SMG.png It’s the fees and shipping that get the price up there, specifically because I’m only looking at the detachable cabled model. Between the two, they add around 250 PLN, which explains the disparity. The V6-Stage looks pretty darn interesting, and I’m actually located in the Pacific Northwest, so I suppose it’d be easy to resolve any fit issues/warranty things with 1964 ears than with Custom Art in Poland, but as with the Viento and Joe, I note that you rated it a bit lower on your scale than I’d expect from a custom in terms of isolation. Would you say that the V6 is still in the same range as the VC1000, an Ety, or other higher-isolation universal IEMs? Thank you both for your advice so far! Yes, the isolation of the Viento-R isn’t the best because of the porting, which gives extra airiness to the sound. I think the overall presentation (note thickness and spatial qualities) of the Viento-R is very good, but the 4.5 represents a bit lower isolation than a typical acrylic shelled CIEM. If isolation is important, it is hard to bet silicone. Isolation of the V6 is similar to a VC1000 at its best (deep-sealing foam or triple-flange tips). Silicone still has an advantage there. …man, am I ever a bonehead. Thank you very much for pointing that one out. Well, that takes the Harmony 8 Pro much closer to the V6 Stage than I’d expected it to be – it looks to be about a $250-300 gap when all’s said an done, to my math. Obviously, not being a oracle, you can’t tell me if that’s worthwhile, but what would you say the difference is between the two in terms of sound? The impression I got from your comparison was that it was a pretty small gap, with both of them being neutral/mild v-shapes, the V6 Stage being slightly brighter and less smooth/natural, but not too far behind. Would that be accurate? I think that’s a nice bit of savings for just checking one box. Yes, I would say that’s very consistent with my impressions of them. Pretty small differences in bass quality and presentation in favor of the Custom Art, and a slightly larger difference in treble refinement, again in favor of the Custom Art. The V6-Stage sneaks in a few punches and I still very much like it (especially for the price), but if forced to pick one as my sole IEM, I’d take the Harmony 8 Pro. Thank you to both of you, you’ve been a great help! I’ll target the Harmony 8 Pro, but keep the V6-Stage in mind as a fallback if money ends up coming a bit shorter than I expect it to. Thank you, in particular, Joker – when this is done, your reviews will have sent me in the direction of both of my endgame headphones, I suspect. Either one should be good enough to stave off the urge to upgrade for a long time. Enjoy! First, thanks for the excellent reviews you’ve been doing for so long. I can’t even remember how long ago it was the first time I found the IEM review thread! Anyway, I’m coming from some Phonak PFE 112s and (two pairs of) Klipsch X10s, and I told myself I’d splurge for customs (namely the Music One) when the most recent pair finally failed. I had used the black filters with the PFE 112s, and liked the bass of the X10s, although sometimes it was a little too warm. To get to the question, what would you recommend between any of those I’ve listed or even something like the GR07. I prefer the Music One to the GR07 even though the sound somewhat different. The smoother treble of the Custom Art cinches it for me. I can’t say it’s better value though, with the GR07 now $99 for the “classic” version. Neither one will sound as warm as the X10 so no need to worry about that. The GR07 has a little more bass punch so it will get you closer to the X10 in that regard, but the Klipsch is a bass-heavy earphone (mildly so, but still) while the PFE, GR07, and Music One can all be classified as “balanced”. If you want a little more punch, the GR07 Bass Edition can also be viable (treble smoothness again not being its strong suit). I’ve been thinking about making an upgrade from my Shure SE215’s, because I would something a bit more detailed, however, I would like to avoid losing out on the bass since I listen to rock (Joy Division, Brian Jonestown Massacre etc.) and also electronic (Bonobo, Chemical Brothers), where bass is quite important. My choice currently has come down to the Custom Art Music One’s and the Dunu DN-1000’s. Now, I know that these are quite different IEM’s, but really can’t seem to decide which one to go for since each of them has their own pros and cons. On one hand, the Music One’s would be much more comfortable and better built while having a great SQ (in addition to the excitement of my first CIEM’s! ), but DN-1000’s will have the more prominent bass. Do you think that someone like me, who’s coming from SE215’s, is going to be disappointed with the bass of the Music One’s due to them being single BA? Or is the bass completely adequate? Last question: does the number of drivers in each of these earphones (single BA of Music One’s and 2BA+1 dynamic of DN-1000’s) have any impact on the detail of the SQ, or is this quite irrelevant in this case? And a bonus question: if, say, the cable of the DN-1000’s breaks, can it be replaced by anyone with a soldering iron and enough skill, or do they have to be shipped to the manufacturer due to a cable replacement possibly impacting the tuning and SQ? By the way, thank you for your great reviews! The bass is significantly lower on the Music One in comparison to the SE215. If you’ve never owned a less bass-heavy earphone, it’s hard to say whether or not you will get used to it (and how quickly). For me the bass is adequate, but I tend to like flatter sound signatures than that of the SE215. I guess we can call the DN-1000 the “safe” choice in this case, and the Music One the risk (but with potentially great reward if you do like this sort of sound signature). Number of drivers is much less important than how well they are implemented and how the earphone is tuned. For instance, the Creative Aurvana In-Ear 3 and the StageDiver SD-2 have the same number and type of drivers (two BAs), but their performance is far apart (including detail level). There’s dozens of other examples like this as well. One other hand, the Sennheiser IE 800 has one dynamic driver and still puts out near top-tier performance, while there’s also plenty of single dynamic earphones that sound awful. It depends on the cable break. Tuning is not really a consideration, but ease of replair definitely is. If the cable goes near the plug, just about anyone with a soldering iron can replace it. If it goes at one of the earpieces, that’s tougher. Probably would need to send it back to the manufacturer or a professional repair/recable service (unless the DN-1000 is somehow very easy to disassemble at the earpieces.. which I doubt). How similar is this compared to the BA200? Similar in the general sense of being balanced with slightly less than average (for a BA monitor) treble brightness. BA200 is a touch darker and has better bottom-end extension whereas the Music One is a bit more midrange-focused, and (to me) a hair more neutral overall. Dang, I really enjoyed the bass presentation on the BA200 and was hoping this would be just as good all around. Thanks for the reply, I think I’ll pass on this one. In that regard the most similar high-end IEM I’ve tried is the StageDiver SD-2: https://theheadphonelist.com/headphone_review/inear-stagediver-2-sd-2-review/ . There’s a custom version of it as well but I believe it’s even pricier. That one is a bit out of my budget but it does seem to fit the bill pretty decently for what I’m after signature wise. Another thing I admired about the BA200 was that it having a treble peak that is slightly higher up meant that there was a better sense of separation between sibilance and the sound of cymbals. Really a lot to like about it, I just couldn’t get a fit to my liking so I went with the VC1000 and combined with Sony Hybrids are the most comfortable earphones I’ve ever had. I just wished it had a tad more mid bass and occasionally similar note thickness of the TDK. Both are great headphones though. Funny you mention that type of treble setup. Was just listening to the AudioFly AF180 which does the same thing. Not exactly affordable, but definitely another strong performer for this type of sound with one of those “high up” treble peaks (which the SD-2 doesn’t have). Oh and one more quick question. Would my VC1000 benefit from an amp like the FiiO E11 if I’m looking for that slight warmth? I kow you mentioned before on how it doesn’t particularly need one but the EQ presets on my Ipod Classic aren’t to my liking and/or cause some type of distortion. This is a much more specific use case than the broad and generic “do I need to get an amp for headphones?”. In this case it’s safe to say the answer is yes, it is possible for an amp to do what you want – I don’t know about the Fiio E11 specifically but the bass boost on my OPPO HA-2 DAC/amp does a good job of boosting warmth slightly without causing any issues. With this purpose in mind you may want an amp that has more than 1 level of bass boost, but I don’t know how many of those are out there. My old Fiio E7 did this (3 levels I believe, the lowest two were quite alright). Hi, I’m going to buy either the music one or music two. Music two is supposed to have more bass and treble. I have phonak 112 and love it with the green filters. I also have the fxt90 and while I really like the presentation and timbre, I feel like the treble and sibilance hurt my ears on many tracks. I really like the smoothness and treble of the pfe 112. The treble is sparkly but I find it not fatiguing and not sibilant. I need to have similar treble than the pfe112. Any less and I feel like the music has no life. But I don’t want any sibilance there. How does the music one compare with the phonak 112? or the fxt90? I’m wondering if I should order the music two, which should have more treble and more everything. *meant to say grey filters. I really like the grey filters. I can’t commend on the Music Two from experience but the Music One has significantly smoother treble than the FXT90 and even grey-filtered PFEs. It’s quite forgiving for a BA earphone. If the Music Two does have a little more treble, I think it would be a better choice for you. Thanks for the answer! You helped me make the decision. Altough I finally decided to try the smoother music ones. I figured I wanted to try a more relaxing, smoother and forgiving iem for reading, studying etc. I’ve been looking at getting some IEMs, and I listen to a lot of classical. Would Custom Art Ones be an alright match for me? The Music One is an accuracy-oriented monitor with a slightly warm sound signature. As long as you’re not expecting a more neutral sound OR heavily enhanced bass, they’re an excellent choice. I’m contemplating between JH5’s and Custom Art Music Ones. I’m in no rush, but JHAudio seems to always have a Black Friday sale to drop the price of them down to $320. Should I pick up one over the other? Unfortunately I’ve never tried the JH5, not even a demo. I’ve heard good things about it but I couldn’t tell you how it compares to the Music One. A sad day, my CK10’s have just failed, have been doing some research on viable replacements and as I have great respect for your opinions (having originally picked up the CK10’s on your say so) wanted to check in and see if you feel this would be a suitable successor? My main concern would be losing too much of the clarity that I so adored in the transition. Hmm… compared to CK10s these have a warmer and more full-bodied sound but won’t be as bright and clear. The Pros and Cons vs the CK10s will be quite similar to what I found for the ER4S in the comparison above. If you want to try something still very balanced and quite clear but with a slightly warmer tilt, these are a great option. If you want to stick closer to the CK10’s sound, you might consider a VSonic VC1000 (https://theheadphonelist.com/headphone_review/vsonic-vc1000/) or Rock-It Sounds R-50 with a tip mod and impedance adapter (https://theheadphonelist.com/headphone_review/rock-it-sounds-r-50/). Appreciate the response, I think I’ll take the dive on the music one as my first pair of CIEMS and maybe scrape up enough to pick up either the VC1000’s or R-50’s at a future date. Really excited to try these and again sincerely grateful for your input. Hi, I am interested in very comfortable iems. For universals I was thinking of choosing Bose quietcomfort 20i, but for a similar price there are theses custom art music ones. This is a strange comparison, due to the quietcomfort’s noise cancelling (I imagine there is a hiss). Is it a no brainer to go with the music ones instead of the bose earphones? And are the rest of the line just as comfortable as the music ones or is it because the music ones are so small (because of the single driver) that made them especially noticeably comfy? I am going to somewhat reply to my own question here. Since I had a bad experience with bose before, and other reviews online confirm my suspicion, I will go for my first customs, with custom art. The question still stands though, and maybe the previous poster is interested to know also, are the custom art 2s a straightforward upgrade, or do they lose that low profile comfort? For me it would be a no-brainer, but then I’m quite used to customs. All silicone customs are very comfortable if they are made properly – I do prefer the low-profile design of the Music One but the differences are minute. I haven’t tried the Music Two but I wouldn’t skip it just because it might not be quite as low-profile. Will the Music Two be coming your way? I am considering the Custom Art Music One there are no audiologists near where I live for me to get ear impressions and I have never owned a pair of CIEMs so I am not sure if it is worth the trouble over getting a pair of universal IEMs. The universal IEMs that I am considering are the UE triplefi 10 and the Etymotic ER 4S mainly because I have read a lot of comments recommending these for hard rock and alternative metal music. I would really appreciate your thoughts on the matter. Thank you! Entry-level customs would really be worth the trouble if you put great value on the isolation and build quality, or if you have trouble finding a comfortable fit with universals. In terms of sound I don’t think either the ER4S or the Custom One is better than the other. The TF10 has a different sound character – it’s not as neutral and tends to emphsize bass more than the Custom Art and Etymotics. I prefer the more neutral Etys and Custom Art to the TF10 but it really depends on your sound preferences. Which of the two would be a better performer for metal or hard rock in your opinion. I have a pair of Phonak 022 with the grey filters in and I love those. And I have a pair of Etymotic MC2s and I find the treble on those to be a little fatiguing. Does that lean me toward the Etys or Custom Art Music One in terms of sound signature? After some digging around I have actually decided on the Custom Art Music Two. But there is the option of getting it with detachable cables for an extra 10 dollars or so. What kind of a difference or advantage does this give me? Is it mainly for easier servicing and repairs? The advantage is that if you mess up the cable you can just replace the cable. I don’t know how Custom Art implements their detachable cables so it’s hard to say what the downsides might be. I love how low profile the cable entrance point is on my Music One, which may not be the case if there’s connector there for a detachable cable, but it’s hard to say with any certainty. I had posted this on Average Joe’s Alclair Reference review but would greatly appreciate your feedback also. I am not a musician and listen to almost every genre outside of rap, one day it can be Incubus, then Tool, then Gojira, then Third Eye Blind, I’m all over the place. I wouldn’t call myself a bass head but I like deep, controlled bass with some impact. Sound stage and clarity is something I miss from my HE-400 headphones, though they are too large to take outside the home (which I dont have a lot of time to sit and listen to them anymore). I currently have a pair of GR07 BEs, Klipsch S4i, and HiFiman HE-400 Headphones. It seems that I have “picky” shaped ears and have a hard time finding a fit. Thus the reason I am leaning towards CIEMs (headphones would be great if they werent bulky). My HiFiman HE-400 are almost the perfect sound signature to me except for the treble issues (I do not know if I would describe it as too bright or sparkly, it just has an annoying “hot” sound to it that ruins some cymbals for me) and it lacks bass impact and speed, though I love how deep the base is and for the quantity it does have it is of a high quality. The clarity and sound stage are to my standards. The GR07 BEs sound mid recessed to me. The bass is good, I would not enjoy any more bass than these give, though I would like for it to extend further down and not go so much into the mids. Sibilance is an issue at the high end on some of my tracks. I want more sound stage from them also. The S4i’s bass is not controlled enough and comes off as bloated. Knowing these things I have narrowed myself down to the Customart Music Twos (supposed to have more bass impact than the 1s), Alclair Reference, and 1964 V3. I cannot find any extensive reviews on the Music Twos to see how the bass has improved. The clarity and sound stage on the Alclair References sounds wonderful, but is the bass enough for me? Thank you again for your time! I hope this was all explained clearly. Not having heard it (obviously), the Music Two still seems the most promising to me in terms of what you’re after. The Reference, to my ears, does have some of that same “hot”/sibilant treble character that the VSonics have. It’s not as bad as with the GR07 but since you specifically mentioned that it is something you want to avoid, I would not recommend the Alclair. The 1964-V3 has a ton of bass in comparison to these – more than with the GR07 BE – so I think it will have too much low end for you. Thats exactly what I was looking for, thanks! I went ahead and ordered the Music Twos. I’ll be sure to post some impressions on Head-Fi once I receive them. I didnt see anything mentioned about an amp in your review, is there a particular portable amp you would recommend with my iPhone 5C? Or would these be fine with my iPhone 5C? They’re not super efficient but the last iPhone I tried (the 5) had a pretty good headphone output. I would think a good amp would not be worth the investment with the 5C, either, but you can see how you get on with them down the line. Hey |joker|, seriously considering these Music Ones. When you say the bass extends well, where would you say it starts rolling off? 30Hz? I’m also wondering about the treble. You say it’s not the most crisp, but is natural and smooth. Do cymbals still have that “tsss” sound instead of the “ssh” of some duller headphones? Does it have the bite necessary for aggressively distorted guitars? It seems to begin rolling off at about 40Hz, audible down to about 30. The Music One pretty good with guitars but if you like a brighter sound it may not be the best option. It has less emphasis in that “presence” range for guitars than, say, and Etymotic ER4 or Philips Fidelio S2. I know what you mean about cymbals but it’s not either or, more of a continuum. The Music One is closer to what you call “shh” but definitely not in a way that impedes overall realism. It’s similar to the HiFiMan RE-400 in this regard. Thanks for the reply! I gather that I wouldn’t be missing out on much in the bass department except on my albums with double bass (or organ music, of which I have none). My main stereo rig (NHT Super Stereo) rolls off at about the same place and I have no complaints. From your comments on the qualities of the bass (good impact and control), am I right to think that these would get my head bobbing on good rock groove? Regarding the “presence” emphasis, I do like a ballsy sound, but only if the recording calls for it. Do the Music Ones oblige when the recording really digs in? Of the common descriptors, I value “natural” and “clear” sound most which is why I was drawn to the Music One. Good dynamics in the treble and an ability to convey delicacy are more important to me than energy, but I definitely want energy when the music calls for it. TL:DR – I love the idea of the naturalness and musicality (which are my two most important criteria) of the Music Ones, but are they truly good all-rounders? Can they sparkle when the recording really sparkles, thump when the recording really thumps, and crunch when the recording really crunches? Will a scorching guitar solo still melt my face? Thanks again for all your help with this. CIEM reviews and expertise are so hard to find, and first-hand impressions of them are so valuable because of the non-returnable nature of the beast. Yeah, I find the bass more than sufficient. Other than that it sounds like it might be just a touch less aggressive than what you’re looking for. The Music One really tends to soften things up just a little compared to something like an Ety ER4S. If you list the IEMs you’ve tried and have liked or didn’t like, I can maybe be more specific. Thanks. The list of IEMs that I’ve owned is a little sparse because I tend to have fit issues with universals. I’ll list out what I’ve though of everything I’ve had long enough to form an impression and just flood you with information. I had the Klipsch Image X10 for a while, but I felt it was a bit dark and muddy. The cable noise was pretty bad, too especially since the cable would never cooperate with over-ear wear. I had the JVC HA-FXT90 for a while and really enjoyed the sound as far as I can remember. The driver flex really bothered me, and I found it near impossible to get a good seal. I do remember them being hard to wear for more than a few minutes at a time, though I can’t remember if it was due to the sometimes strident sound or the fit. I have the VSonic VSD1S, and the sound is pretty enjoyable when I get a good fit. When the seal is just right (rarely), the bass honestly feels a bit overdone, but nothing bothersome. The highs are nice (sometimes a little grainy, but usually just about right), and the only thing that stands out as bad is the occasional congestion of the sound. The thing that I can’t stand is having to switch L/R to put it over the ear. I am a bit of a Grado Fan, mostly for the astonishing clarity and airiness. The sharp highs are bearable, but I find I don’t wear my tape-modded SR-80is for more than an album at a time because my ears get tired, even at low volumes. The bass texture is really nice and with fully taped bowls, it extends pretty far down with good impact, too. I had some Sennheiser Amperiors, but never really fell in love with the sound. It was exciting and extended really well. I really enjoyed it, but I just stopped wearing them over time because there was no love. Now for my favorite headphone, despite its shortcomings: the Sony MDR-ZX700. The music is so damn pretty, even if I feel there’s a bit of a plasticy resonance. The bass doesn’t really extend far enough for my taste but is in good proportion to the whole sound. I have no issues with the treble amount as I could wear them all day, but the quality is a little lacking. It’s a bit rough and uneven. The only real reason I moved on from these was comfort and build quality issues. My ears are too big for the shallow cups and any pad mods ruined the beautiful sweetness of the sound. Also the cord made lots of noise at the place where it connected to the cup. Thanks again for all your help |joker|! Your contributions to personal audio are fantastic! The X10 is definitely bassier and darker than the Music One, so no problem there. The FXT90 is one I rather like myself. It seemed there was a lot of variation with the driver flex. The treble on these was more peaky compared to the Music One – the Custom Art really is quite a lot smoother. It has less bass than the JVCs, too. The VSD1S is easiest to compare to since I use it all the time. The Music One has less bass (the VSD1S actually has more than even the GR07 Bass Edition), the mids are not as recessed, and it’s a little more laid-back in the upper midrange and lower treble region. All of the VSonic IEMs exhibit very strong presence there, which can make them sibilant at times. The Music One is not darker than the ZX700, though. The Music One is a little quicker and has better separation than the VSD1S. Sorry, no experience with NHT speakers. I use a pair of Emotivas at home and while I don’t think the Custom Art can (or should, really) compete, it definitely does well enough for when I’m the go. I asking myself to buy custom One, I want something that do a good job with rock. I have a FAD heaven vi,wooduo 2, sennheiser ie60. Has the custom One Deep bass and a good dinamyc against my earphone? The Custom One has a lot less deep bass (and bass in general) than something like a Wooduo 2. It’s a reference earphone with no bass enhancement, and even in that context its bass is among its few (relative) weaknesses. If you’re buying the Custom One you have to be sure that you’re okay with a flat/balanced sound and just hearing whatever bass is present on the track. For enhanced bass to compete with a Wooduo 2 or IE60 I’d look elsewhere.